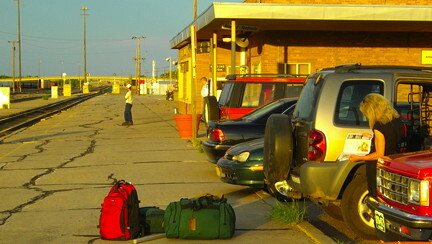 Waiting for Amtrak's Southwest Chief, La Junta, Colorado. 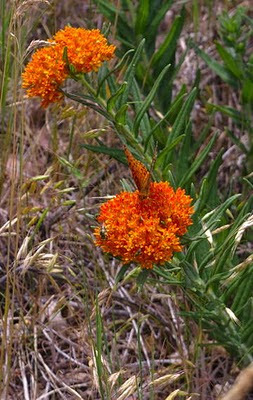 Two members of the Asclepius (milkweed family) growing near the house: butterfly weed (Asclepius tuberosa spp. terminalis) and antelope horns (Asclepius asperula). I had to look up the botanical names, being normally happy just to remember the genus. Its name comes from Asklepios, son of Apollo and god of medicine. Antelope horns is definitely an odd-looking wildflower, with its green-turning-white petals. Butterfly weed is a mainstay of high-altitude xeriscape gardening, but this one is wild. 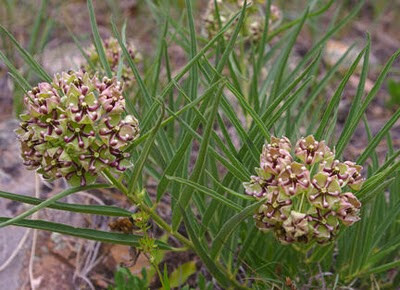 Monarch butterfly caterpillars feed on antelope horns in some areas. Shale oil hasn't gotten too much attention since the oil crisis of the 1970s. But today, proponents are once again pointing out that there are more than a trillion barrels of oil locked in the shale deposits of Colorado, Utah and Wyoming, more than all the proven crude-oil reserves on the planet. That would be enough to meet current U.S. oil demand for an entire century. The problem, then and now, lies in the financial and ecological costs of extracting the oil. Shale oil naturally occurs in the form of kerogens, solid, waxy substances with a texture similar to that of ChapStick. Once the kerogens are heated to over 500 F, they exude hydrocarbons, which must be treated with hydrogen in order to be processed into usable fuel—a highly energy-intensive process that releases large amounts of CO2. And just to get at these kerogens, energy companies would have to mine and process millions of tons of shale from the earth—leaving behind toxic heavy metals and sulfates that could seep into groundwater. "There's a water contamination issue," says Olayinka Ogunsola, an engineer at the Department of Energy. "There's also a land reclamation issue—[mining] would create a lot of disturbance in the area." Mining and processing shale also require vast amounts of water—producing 2.5 million barrels of shale oil per day would require 105 million to 315 million gallons of water daily. That might be the biggest deal breaker of all for parched western states. I have had a hard time making that argument to people from the wetter end of the country, who see the numbers on potential barrels of shale oil and simplistically say, "Problem solved"
Other than the Medano and Parkdale fires--both too far away for my little department to become involved with--it has been a quiet summer. But now the thunderstorms are coming, and I got my first fire call about five o'clock this evening. Smoke up the canyon at mile marker 20. We rolled both of our trucks. T. picked me up in the brush truck, and we started up the highway. Mile marker 21--nothing. Mile marker 20--windows down to smell smoke, looking up the steep mountainsides--nothing. 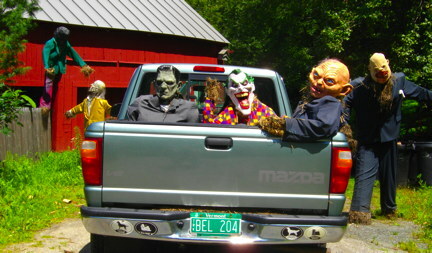 We drove the brush truck, lights flashing, through an informal camping area, where there was indeed smoke hanging over campfires, no doubt alarming the campers, but saw nothing unusual. It turned out that the smoke was much higher up the mountain than we were looking, by the time we learned its location. And a Forest Service guy arrived to say that their crew was coming. Given that the smoke was (a) on national forest, (b) not likely to threaten any homes, and (c) wa-ay up there in the thick timber on a north-facing slope, we were happy to load the shovels, fire rakes, etc back in the brush truck and go home. Supper was waiting, and I toasted Smokey Bear in cheap Australian shiraz. Meanwhile, there is a hazmat class this weekend. On Sunday, June 27, I placed another "camera trap" on a faint game trail on the national forest near our house. On Monday the 28th I walked the dogs up the Forest Service road nearby. Fisher, the madcap young Chessie, went galloping up the road as usual, but Shelby, the older collie mix, was staying closer to me. Then she was lifting her nose and staring up into a narrow little meadow. 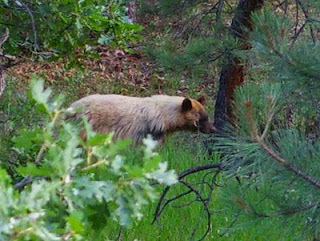 I looked too, and saw the head and shoulders of a bear up there in the oak brush, perhaps 80 yards away. Since Shelby tends to forget what "Come" means when she is excited, I snapped a leash on her. Fisher came racing back, and I made him sit and wait for a few moments to give the bear time to move away. 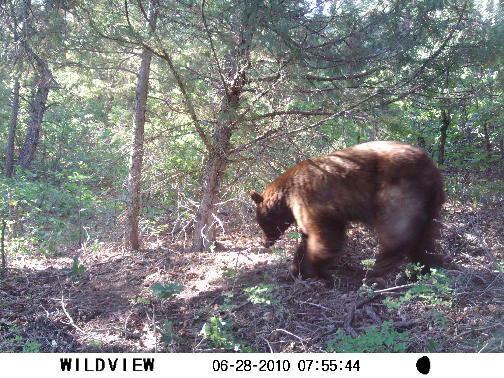 Given the terrain, the bear probably was moving parallel to the road. I did not want the dogs to scent it and give chase--who knows what might happen? So I convinced them that they really wanted to go home and have breakfast. 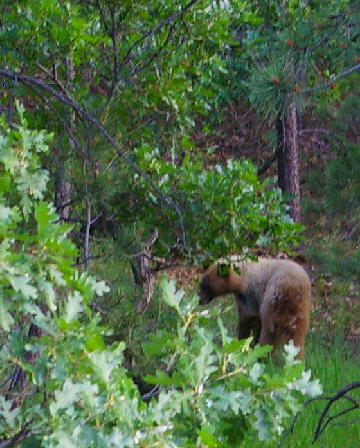 Fisher did break and run up toward where the bear had been, but I whistled him back, and we went home without incident. Today I retrieved the camera. Notice the time and date on the strip below the photos. They seem to show the bear first moseying toward the little meadow and then retreating after it encountered us. I am going to rest this spot for a while, but I think it deserves another camera visit later. It's in thick cover, and I have seen no sign of anyone but M. and me ever walking up there. I broke my own rule last evening about not always keeping a long lens on my camera in case something wanders by. 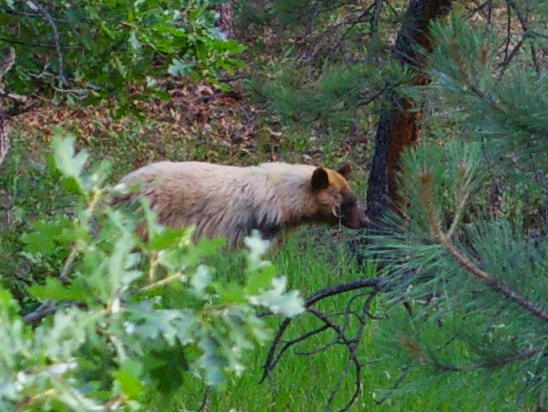 In this case, it was an unusual blond bear, whose darker legs and face reminded us of a Siamese cat. I have never seen that color phase before. But after getting two large barking dogs under control, it was all I could do to grab a couple of shots with the 55mm lens. 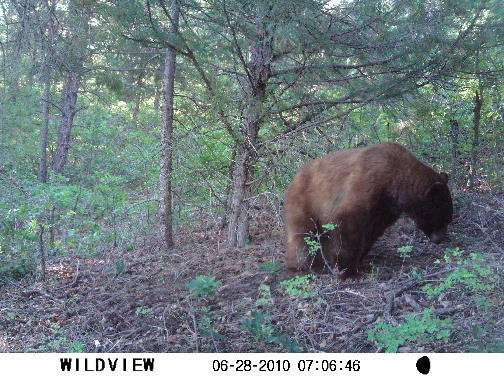 The bear was less than full-grown. M. and I will know if we see it again. I have decided that the best summertime online weather forecast is not from the National Weather Service, nor the Colorado Springs TV stations, nor Accuweather or Weather Underground nor any other commercial site. During fire season, I go to the Rocky Mountain Area Fire Potential Outlook weather briefing. Narrated by a serious, nerdy sort of voice (definitely not a broadcast media major), it gives more detail about what is going on than do any of the television meteorologists. The focus is on Colorado and Wyoming, but you can also see what is happening large-scale in New Mexico, South Dakota, Nebraska, and Kansas. It looks like southeastern New Mexico is getting some moisture flow from Hurricane Alex, but that flow is being blocked from our area, unfortunately.